Apple Watch Sport band is loosing a layer?? Discussion in 'Apple Watch' started by darkgremio, May 15, 2015. I don't know how to explain this in words, but it seems like my apple watch sport band is loosing a layer of it's plastic or film...Here's a picture it's hard to explain. I got Apple Care+ and such, so it should be covered under it right? Since it came with the watch right? The otherside of the band that you tuck the excess band in it is perfectly fine. It's just the band with the holes. It's a defect. Apple should replace it. Not the first time someone experienced this on a black sport band in these forums. Mine is showing similar wear signs. Waiting on my white sports band to be delivered, then I'll address this issue with Apple and hopefully they'll just replace it. Exact same problem with mine, and on the same side as well. Called AppleCare and they are shipping me a replacement band and told me to just keep the original. Great service! Same problem with my Space Grey Sport. Within the first 2 days I had shiny spots where the excess band tucked in. It was only on the inside and couldn't be seen when you wore it so I just ignored it. Now I'm getting the peeling spots so I'll be calling Apple this week. Yes that is a defect others have reported, up until now I had only seen reports of it on Space Gray Sport bands. That's not normal wear and tear. I'd definitely report it to Apple. Since others have the problem should not be unfamiliar to Apple at this point. Looks like a case of rubber blooming. The band is fine but the appearance will bother some people, just have it exchanged. Might be, depending on what the OP used to clean it. 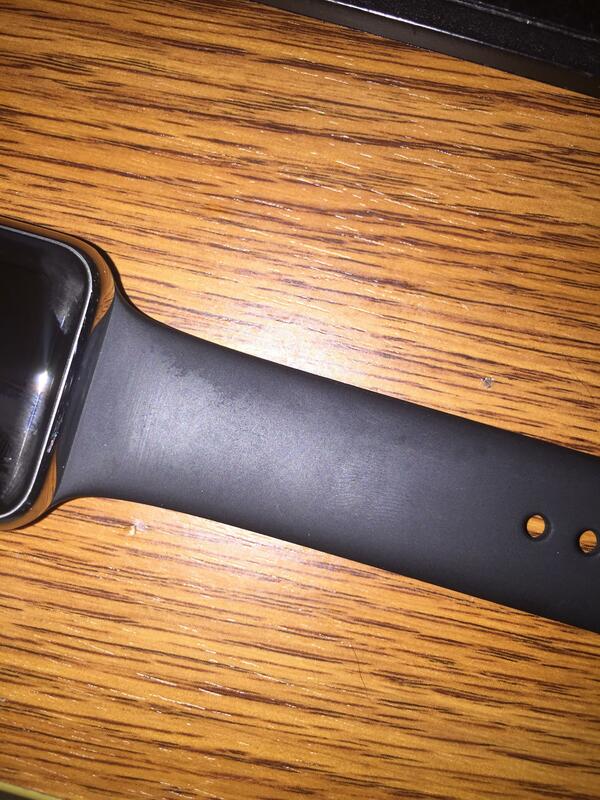 These silicone bands will not stay looking new for long. Out of interest does the part of the band where the finish has been removed feel tackier/less soft/smooth? I bought a blue band from CeX which was sold as 'a' grade, but it feels different to my black and white bands, and looks a bit different too. It's definitely genuine Apple, so I'm wondering if the finish started to come off and they finished the job. Literally had mine less than a day and it's started happening to mine. I have a replacement on the way for the same issue. The apple reps weren't thrilled about it. Kept telling me it was "normal wear" for a 10 day old product. All of my black rubber watches still look great after years. I would demand a replacement. This is a load of crap. Clearly some of the black bands are defective because this is becoming a common complaint and barely anyone even has their watch yet. Surely you didn't expect a $350 Apple Watch to be shipped with a band that would last for more than two weeks. I think an important question is if there are people that do NOT have this issue. I worked for a company that sold automotive parts. They had a shifter knob with rubber on the top. Only on select people the rubber had a similar issue. It seemed as though it was the sweat/oils for some people, not all, that created the issue. Well of course I clean the band, I mean I work out in the thing. I just use soap and warm water. I talked to Apple and I guess the engineering team is going to get back with me, I had to upload photos and such. Same issue here with owning it for less than 3 weeks. Contacted Apple waiting for an advisor to get back to me later today. Would this be covered even if you do not have Apple Care +? I already got my replacement band, hopefully this on does't have the issue. Only time will tell. 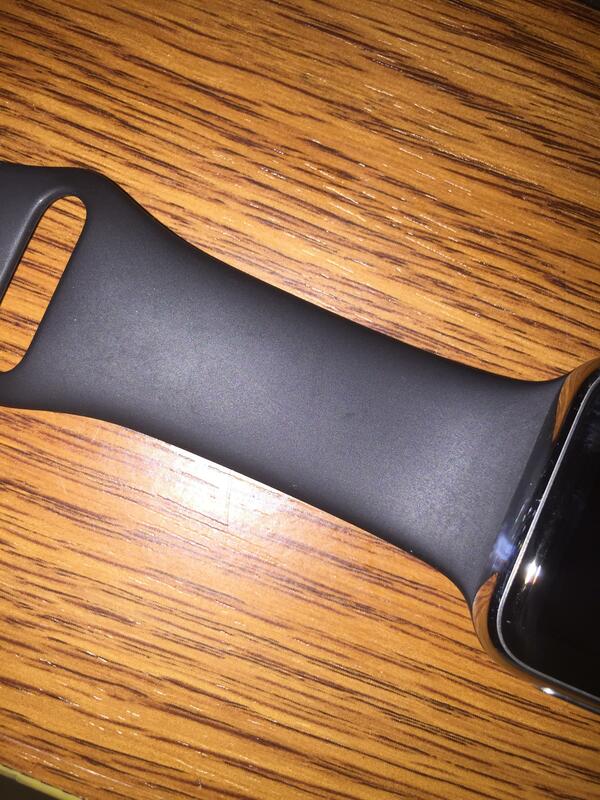 That's normal wear and tear, Apple already advised that would happen on the sport bands. I have the same wear on my black and white bands. Not sure what you guys are expecting but it will happen on every sport band.